Meet Frogmosher, Eyez, Squideye, Baxter and Ravtonstein. As weird as their names are there is no need to run in fear as these are very friendly monsters who bring a splash of colour to the reels that will brighten up your day and they love to help you land monster combinations! 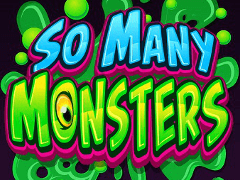 So Many Monsters was released by Microgaming as part of a three game series alongside the So Much Candy slot machine and the So Much Sushi slot machine. The background of the So Many Monsters slot machine consists of silhouettes of all the quirky monsters that you’ll come face-to-face with and there is an upbeat tune that attempts to set a spooky mood without terrifying you (typical of that you’d expect in a children’s cartoon show) playing out to accompany the reels spinning. Boasting an impressive 96.22% RTP, So Many Monsters is played across 5 reels and 25 paylines (the paylines are fixed therefore you cannot adjust them to play a lesser amount) and enables you to bet 1p up to £4 per payline, meaning you can spin the reels from 25p up to £100 per spin. However, it’s all about the split symbols bonus feature as you can get monster combinations of up to 25x and there is also a friendly free spins mode that never fails to result in monstrous wins! The Wild symbol is the So Many Monsters logo which can substitute for all other symbols, except for the Scatter symbol which is represented by a rather creepy Monster’s Eye. While there are Ace, King, Queen, Jack and 10 playing card symbols, it’s the five monsters who are the most valuable in So Many Monsters and you certainly won’t miss them thanks to their bright and bold designs. You’ll have a meet and greet Frogmosher (red), Eyez (yellow), Squideye (green), Baxter (purple) and Ravtonstein (blue) and they are valued in that order too with Frogmasher offering the highest payouts of all – let’s ensure we keep him happy and not do anything to turn him against us. Like the other slots in the ‘So Many’ series from Microgaming, the So Many Monster slot machine is all about the split symbols feature where the monster symbols can split up to five times and create more winning combinations. While standard slots play sees us attempt to land five symbols on a payline, the split symbols feature means that you can potentially create combinations of twenty-five monsters, and just to highlight how valuable this can be, Frogmasher who is the most valuable monster of all appearing twenty-five times will see you scoop 640x your line bet! Every time you land three or more Monster Eye Scatter symbols on the reels you’ll be enjoying a free spins bonus game under its watchful eye - with wins that will leave you feeling dizzy! You’ll also be excited to learn that you can retrigger additional free spins by landing three or more of the Monster Eye Scatter symbols while your free spins occur which certainly results in monstrous wins every time. The title ‘So Many Monsters’ instantly makes you assume you are in for a terrifying experience with lots of creepy creatures on the reels but nothing could be further from the truth. There are five colourful monsters that wouldn’t be out of place in a children’s cartoon show and they offer lots of winning possibilities thanks to the split symbols feature and the free spins feature which is relatively easy to trigger!